where's the mac download link? The torus transition and the strange music saved it. It seems really optimised for it, so on Windows it's quite an average invitation. The "Input" tab on the .exe is a mistake or is there a secret interactive part? I tried VR and it doesnt really impress me: You are disconnected from the scene because it feels like looking through a "keyhole" on something far away. 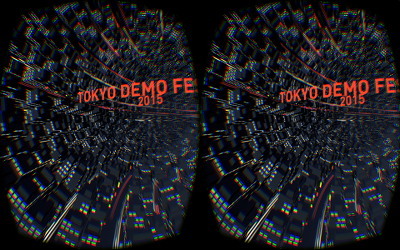 First VR demo. Made me kinda dizzy on the tunnel but that's oculus for yah. what everybody else already said. Hey, hey! We need youtube! Where is the 60fps HD Youtube Stereoscopic Panoramic Video ?!!! @moderator: plz change the "Mac OS X" platform tag and download link to "OS X intel". Yes I know that currently intel is the default, but still on pouet we used to distinguish intel/ppc/unibin releases. And "Mac" OS X intel stuff can run on almost any intel peecee nowadays. I couldn't play them on my very old, updated Windows XP Pro SP3 machine with its ATI Radeon 4870 video card (512 MB of VRAM). I enjoyed its YouTube video capture recording. Nice tune. Nice song and tunnel effect. page created in 0.017925 seconds with 16 queries.